We all love reading those business signs on the side of the road, especially when they’re funny or inspirational (or for some, when there’s a grammatical error) but what if they’re not funny, or worse, they have a negative message? A shop owner in New Annan, P.E.I., learned the true meaning of the old adage ‘everyone’s a critic,’ when Josie Candito, owner of the High Park Master Mechanic in Toronto, took offence to one of his signs. Earlier this year, John Mellish posted a joke on the sign outside his mechanic shop: “Women are like snowflakes. They can’t drive.” But when a picture of the sign went up on social media, Candito felt she had to respond. Debate on the issue falls between those who side with Candito and those who believe that because it was a joke, it shouldn’t be offensive. After all, it was just playing on the stereotype that women are bad drivers. But are they? According to a study done in the UK, women are actually better drivers than men, scoring 23.6 points out of 30, compared to men’s 19.8. The stereotype that women are bad drivers is slowly being eroded. In May of last year, Audi Ireland began a campaign on their Twitter account, linking to articles about women pioneers in an effort to turn the stereotype around. 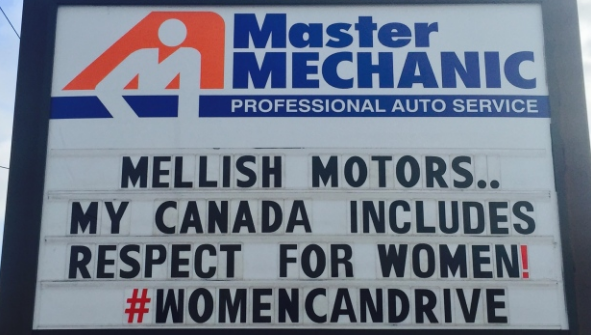 In the meantime, when it comes to women drivers, Master Mechanic High Park shop owner Josie Candito has done her part in setting the record straight.